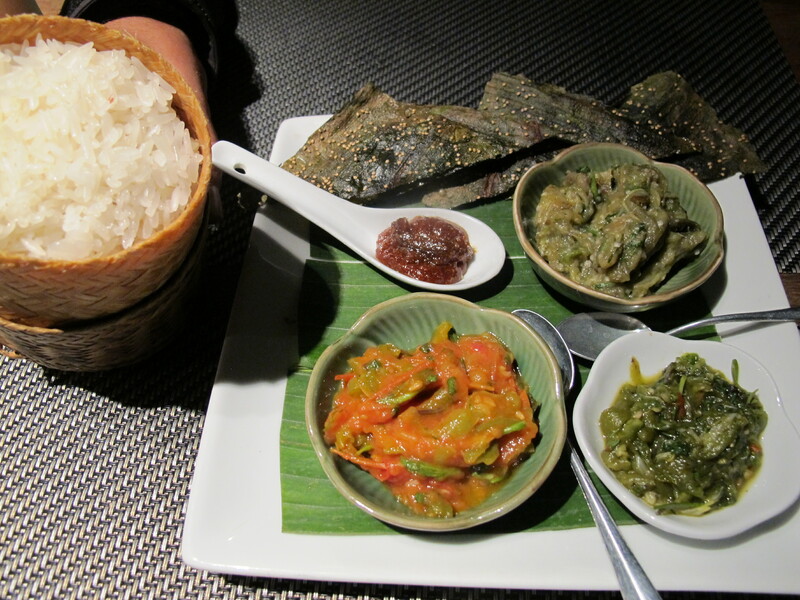 This post is all about Lao food! However, we found that Laos has its own cuisine and even though it is not as famous as the food in its neighbour country, we found it to be pretty good indeed! Sticky rice (khào nîaw): this is Lao national dish! It is cooked by steaming the rice in bamboo pots and it is served in small and beautiful bamboo containers. 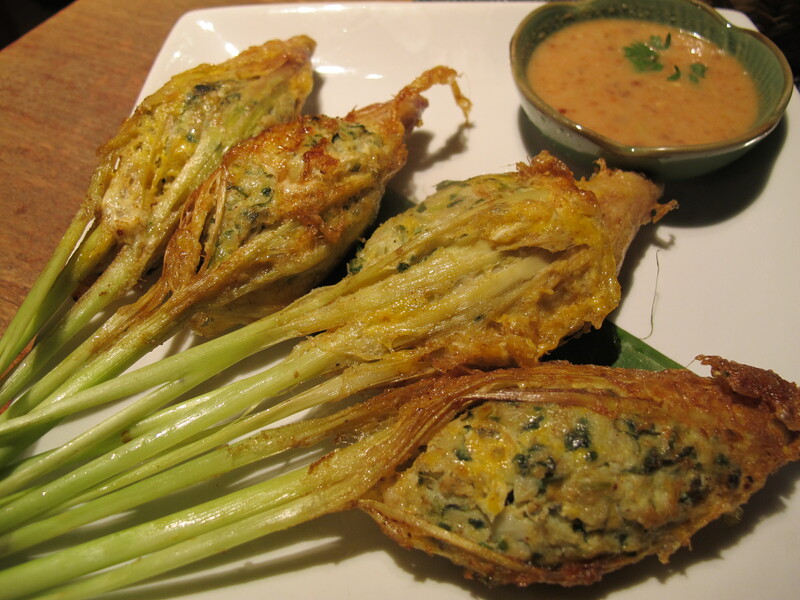 Lao people make rice balls with the fingers and dipp them in the dipping sauces (see below). Dipping “sauces” (jâew): made with roasted tomatoes, roasted eggplant, peanuts or chillies, they are eaten by dipping sticky rice in them. Algae from the Mekong (khai phun): dried, seasoned river moss that it is eaten as snack or with jâew and sticky rice. 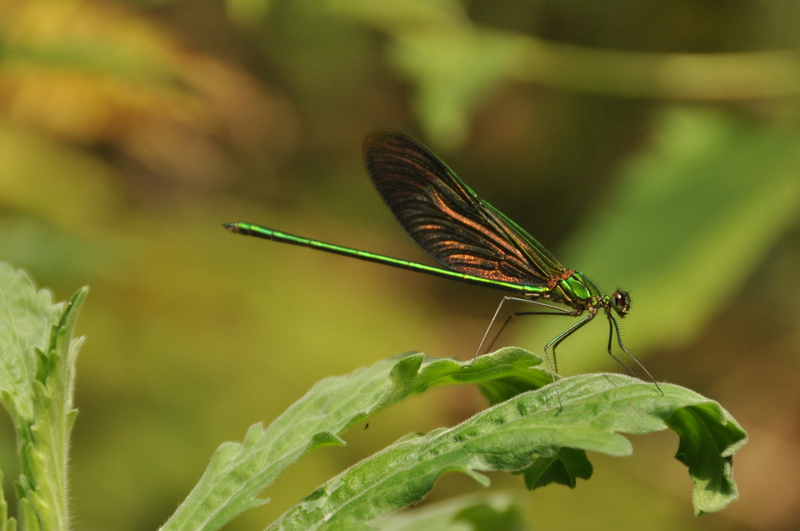 We saw it in Muang Ngoi and Luang Prabang. Papaya salad (tàm màak-hung): made with shredded green papaya, lime juice, chillies and garlic pounded in a mortar. Làap: cold meat salads made with chicken, pork or fish. French bread (baguettes): eaten for breakfast with butter and jam or sweetened milk, or as a sandwich any time of the day, they are delicious! Barbecued chicken (ping kai): chicken and other meats are grilled during the evening in many street stalls and restaurants. Women usually come with grilled meat to sell to the passengers of buses or tuk-tuks when they stop in the villages. Beerlao: the national beverage and the best Asian beer that we have tried so far. 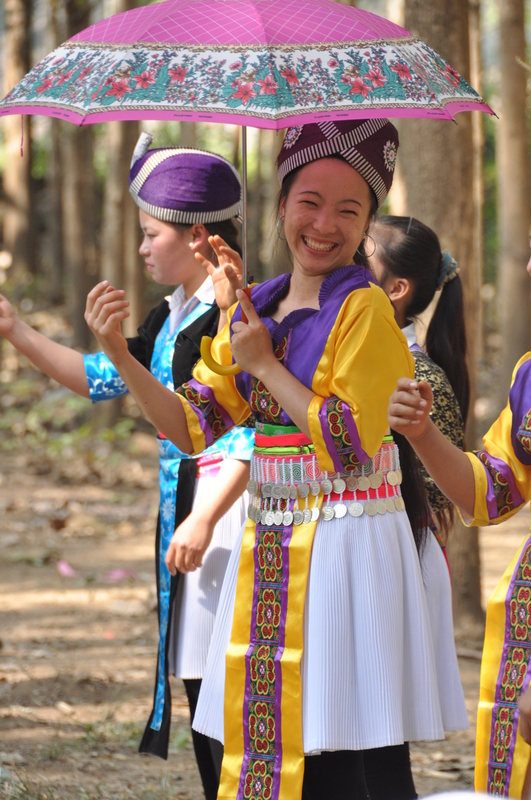 Lao people are really proud of it, and with a reason! Lào-Láo: rice whisky which is consumed all over the country. The best one is the one made at home by the locals. We tried it in a village close to Muang Ngoi and we managed to buy some (literally by the back door) in Muang Ngoi itself which we drank for Christmas dinner. 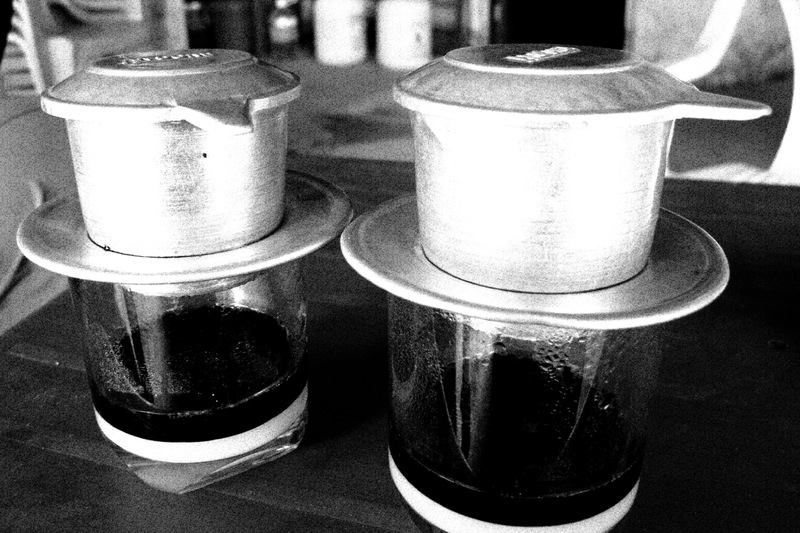 Lao coffee: strong black coffee with sweet milk. And for dessert: sticky rice cooked in coconut milk and served with fresh fruit such as banana and pineapple. Croissants and other French pastries are found in bakeries in Luang Prabang andVientiane. At the beginning, when we were planning the trip to Laos, we were going to fly from the capital, Vientiane, directly to Phnom Pehn. But finally, because we do not really enjoy flying and because crossing the two countries overland would be cheaper, we decided to take local buses to get from Northern Laos to Cambodia. And so glad we did! In that way we had the chance to stop by the Southern part of Laos, a place called Si Phan Don, literally, “four thousand islands”. 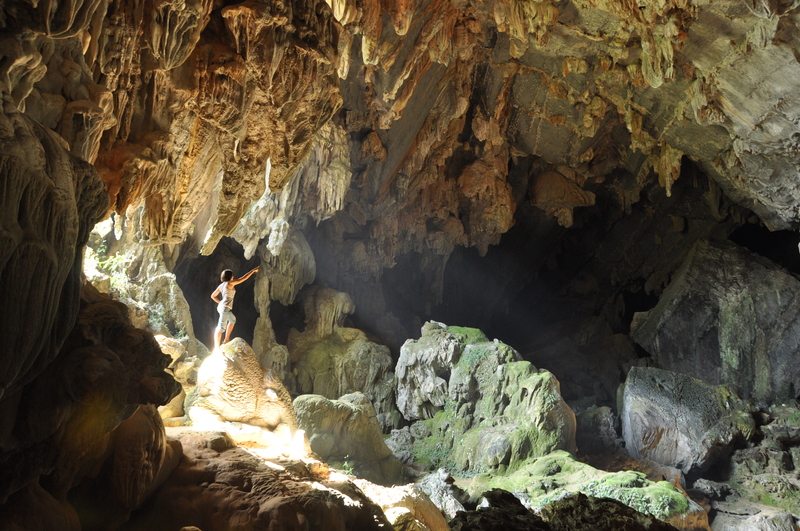 The place is called like this because in the dry season, the Mekong river recesses and thousands of islands all over the area suddenly emerge. As you can imagine, the landscape is stunning. However, the thing that I recall the most is the relaxed atmosphere that has taken the whole place. 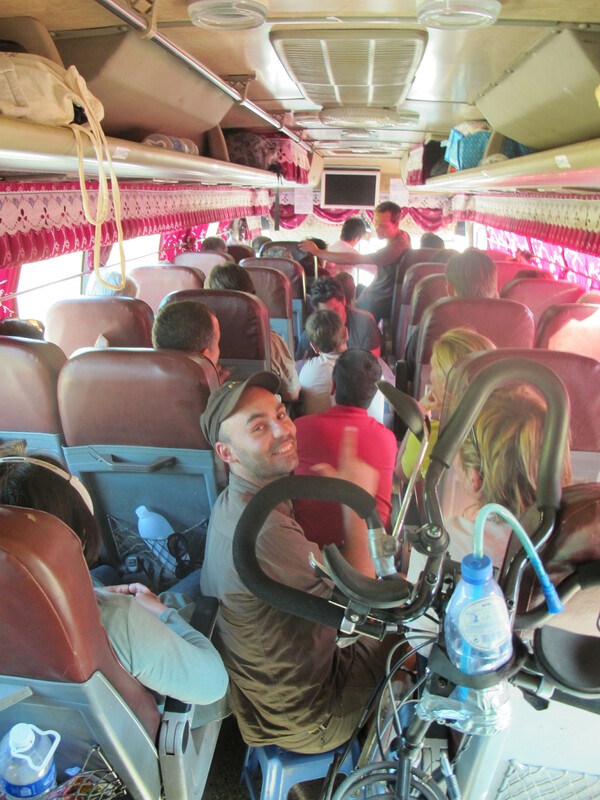 As mentioned in the last post, we took the night bus from Vientiane to Pakse. By the way, if you have the chance to take this bus, do it! It is the best night bus of the whole Asia, especially if you are two persons. I will explain: the bus has double beds for two persons, so I am sure how the experience is if you travel alone and you have to sleep so close to someone else who you do not know. But as we were two, and a couple, we loved it! A small tip: it is better to get a lower bed rather than an upper bed. We got a huge double bed for a bus (maybe 120 or 130 cm), together with pillows, bed linen, bottles of water and some cakes. We were prepared for one of those nights in buses where you do not get to sleep so much, but when we arrived to Pakse, we had to be awaken and we would have wished that the trip would have lasted longer! 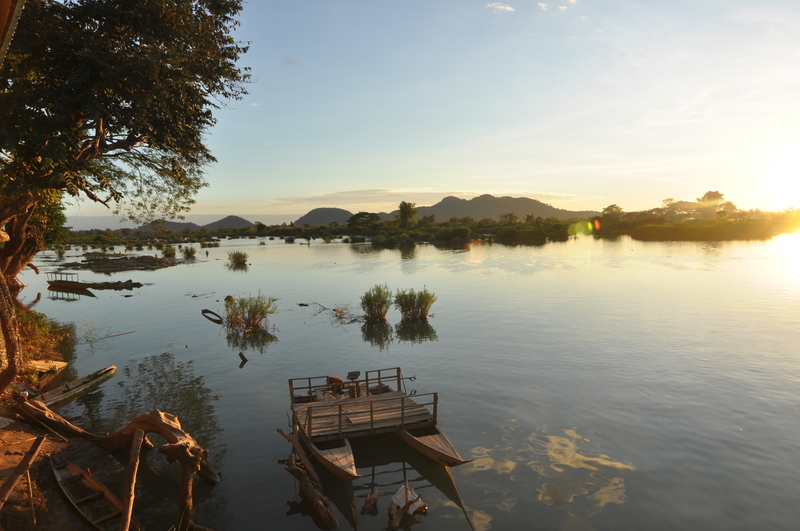 But coming back to the four thousand islands, when we arrived to Pakse, and after changing bus station, we took a tuk-tuk to Don Det (around 3-4 hours), one of the permanent islands of this peculiar archipelago. We were not sure to which of the main three islands (Don Khong, Don Det or Don Khon) we should go. 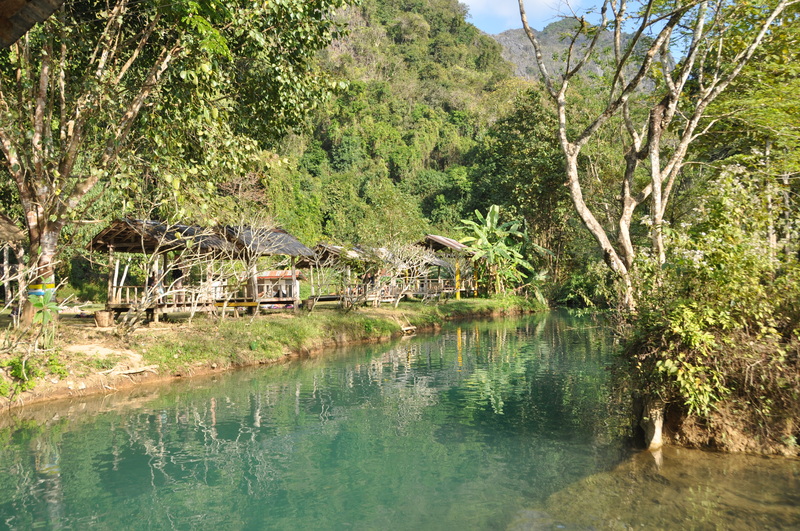 According to the guidebook, Don Khong or Don Khon would have been better choices for a relaxed stay, while Don Det was more like a party place, similar to Vang Vieng. However, following the recommendations of some people, we finally decided to give a try to Don Det. 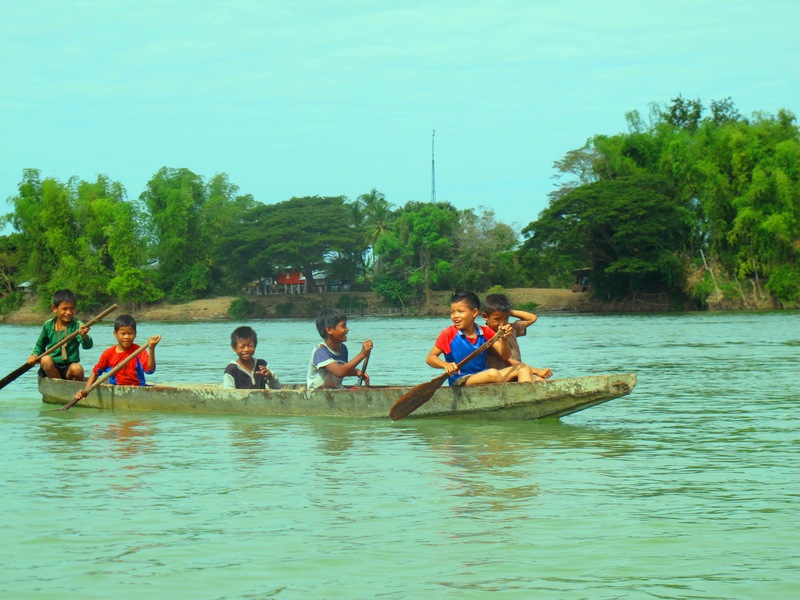 The tuk tuk left us at a village called Ban Nakasan and from there, a small boat crossed us to Don Det. In Don Det, we rented a couple of bikes and loaded with our four backpacks (yes, we ARE crazy), we went to find a nice bungalow. We cycled to the area of Don Det called “sunset boulevard” where we found a nice and simple bungalow for 20000 kip (around 2 euros!). The place was really basic, but the views were amazing!! We were so happy that we decided to do nothing but enjoying for the rest of the day! We cycled a little around, read on the hammock, had lunch at the restaurant by our bungalow, had a nap, drank coffee with sweet milk and crushed ice (hummm, delicious!! ), had a swim on the little beach by the “harbour”, enjoyed great Indian food and called our families with skype. What a wonderful day! Every time I think of Don Det, I feel like coming back…I really liked this place, and it was not the “crazy-party” place that the guidebook described. It was all pretty calm and extremely beautiful. Moreover, we met a couple of French people who were staying in Don Khon (supposedly quieter) and they said that there had been loud music every night, and that everything was more expensive and not as nice as Don Det. So you should never trust the guidebooks, but listen to the travellers’ advice. In the evening, we saw the sun setting from our hammock. Fishermen were coming out in their boats for the nights fishing and it was beautiful just watching them throwing their fishing nets to the water under the warm sunny light of the afternoon. There is still plenty of things to see around Don Det that we didn’t have time for, but isn’t that the perfect excuse to plan our return to the four thousand islands?? 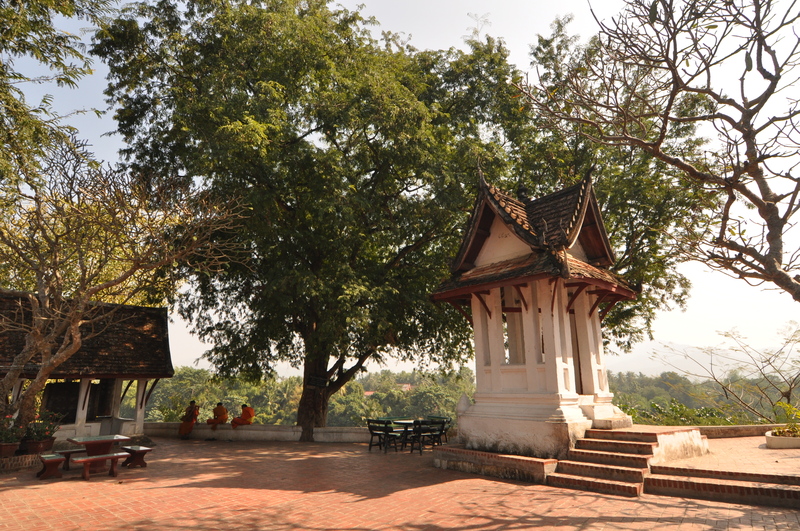 Most travellers to Laos either skip the capital or only use it as the entering or departing point. However, even before coming to Vientiane I knew I would like it. A relaxed city by the Mekong, lots of good restaurants and cafés and some of the most beautiful temples in the country would for sure keep us busy for a couple of days. 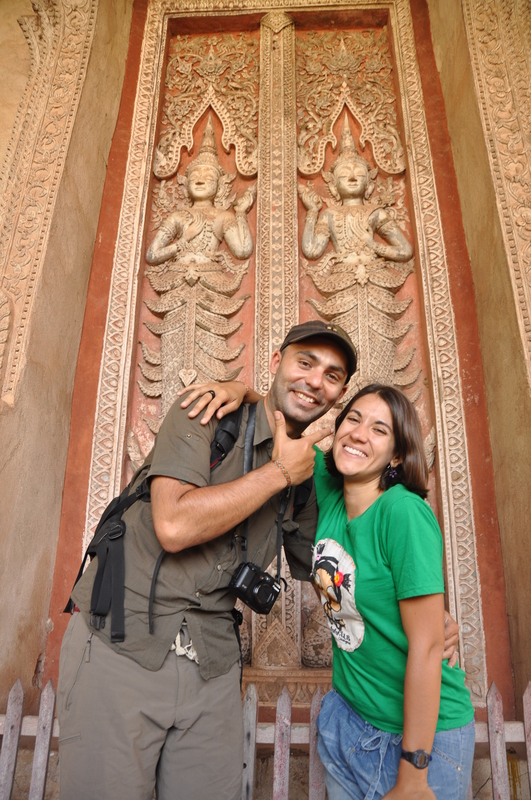 We were also going to spend New Year’s Eve in Vientiane and that was really special for us too. The choice of a place to spend this night was difficult, but we finally choose Vientiane because we thought it would have some New Year celebrations, but it would not be too busy/crowded. We took an early bus from Vang Vieng and we arrived to the capital around 11 a.m. The first thing we did was to look for accommodation for the night. 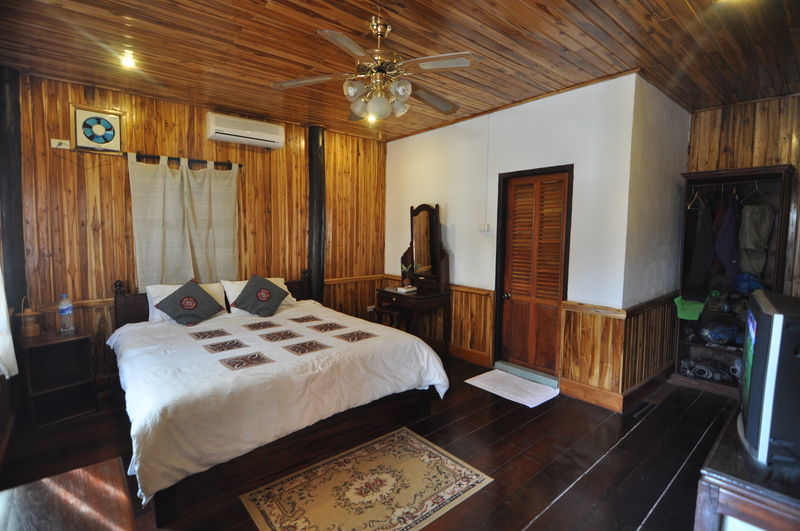 We chose Lao Heritage Hotel because it was a beautiful traditional Lao house in a quiet and central location and the price was reasonable. Because we hadn’t booked in advance we could only get a twin room, but the French owner (a kind woman) gave us a warm welcome and we were happy with out choice. After a refreshing shower, a noodle soup and a fruit shake, we rented a couple of bicycles for the next two days. 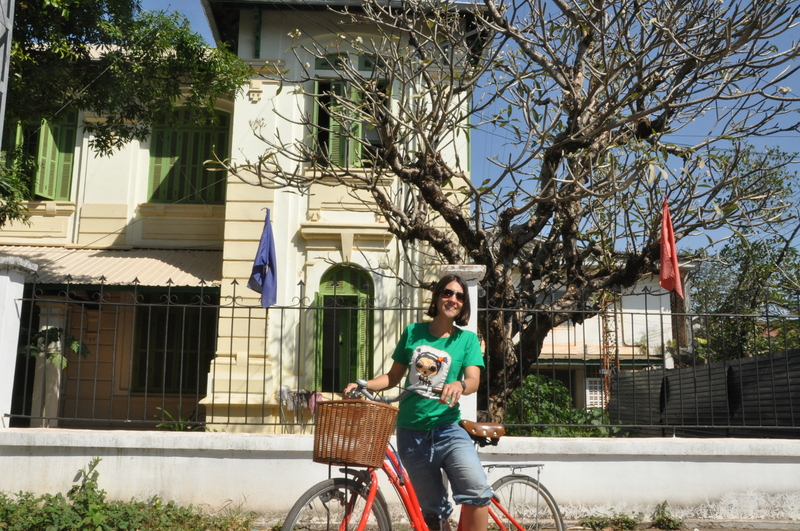 Vientiane is a perfect city to visit by bike (not too big, mostly flat and with little traffic) and we loved it to visit it that way! We felt very good in this city from the very beginning and we thought that it could be because visiting it by bike reminded us to our second home, our beloved Copenhagen. That afternoon we first rode along the Mekong and then we visited the Patuxai, the Lao “Arch du Thiumphe” and the Pha That Luang. 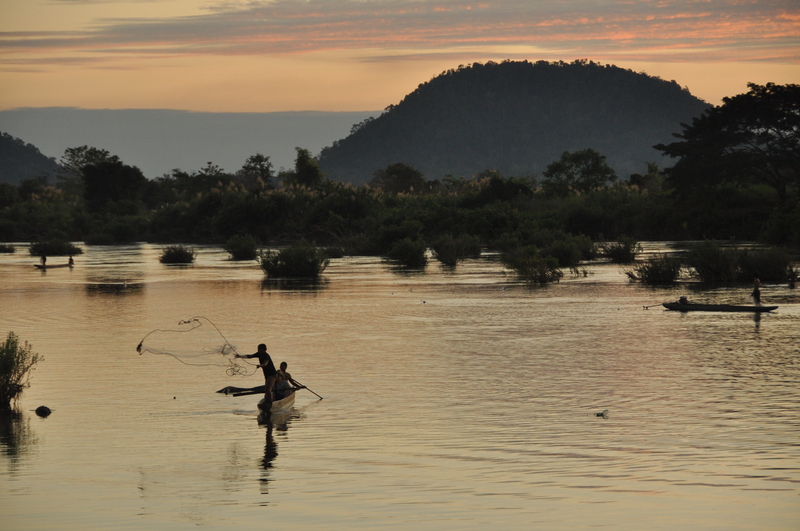 Just before sunset, we came back to the riverside in order to see how the sun hided slowly behind the wide Mekong. This was easily the best New Year sunset of our lives and definitely the most pleasant New Year’s Eve in terms of weather (around 25 degrees!). After resting in the hotel, we went to have New Year’s Eve dinner at an Italian restaurant in a lively street of the city center. For once, we ordered everything that we wanted without looking too much into the price: we had some appetizers, salad, Italian pizza , homemade gnocchi and half a bottle of red wine. And for dessert, ice cream and tiramisu. When we finished, we were already really tired because of the whole day full of activities, but we forced ourselves to stay awake to welcome the New Year and we went to one of the New Year’s Eve open air celebrations close by. Luckily, we met David, a Swiss guy whom we had met in Muang Ngoi a few days back, and his two German friends and we entered 2012 with some company. When we got back to the hotel, we called our families who were getting ready for the New Year’s Eve back in Spain and we promised to call back in the morning, when it would be 1 a.m. of the New Year for them, because of the 6 hours difference between Laos and Spain. As promised, we woke up early to call our families back home with Skype. Still very sleepy, we wished them Happy New Year while we saw each other with the webcam. At some point, we tried to have a three parts conversation with Ivän’s family in the South of Spain and with my family in Madrid at the same time, and we had a lot of fun. Suddenly Iván’s mum and my mum could talk to each other, and we could see everything, but they could not hear us. We all laughed a lot!! Iván’s sister, who was spending New Year’s Eve at her boyfriend’s town, in the Northwest of Spain, was also connected and we could also see each other and wish each other Happy New Year. We were really happy to be able to see them and to feel them so close to us despite the distance. We had New Year’s breakfast at one of the French cafés and after that we continued our exploration of Vientiane: we visited the famous temples of Wat Si Saket and Haw Pha Kaeo, with beautiful Buddha sculptures in all positions and styles. Then we visited the old market, Talat Sao, which we did not like so much. 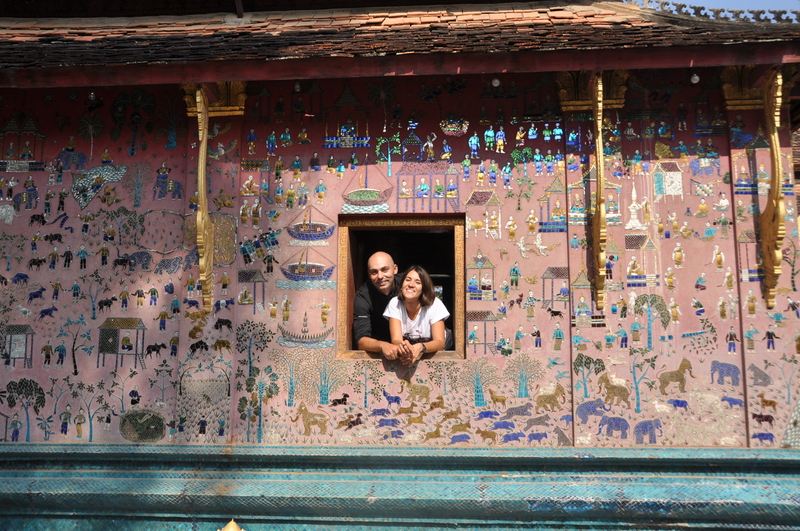 After a lunch made of noodle soup and fruit shakes, we stopped in Wat Si Muang on the way to the Lao sauna. Because it was a Sunday, it seemed that the whole population of Vientiane was in the temple. 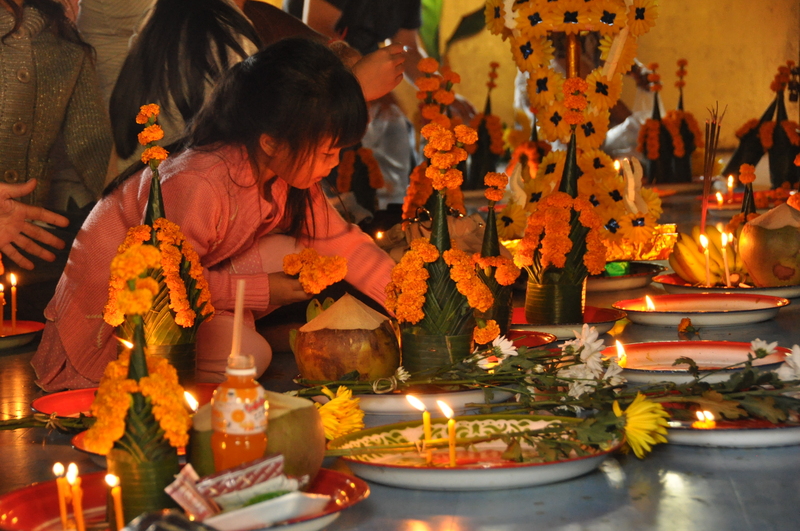 The site burst in activity: women preparing the offerings, made of bananas, flowers and candles, parents bringing their children to make their first offerings, people sitting around a monk, all connected by a thread, while the monk said a prayer, etc. We stayed there for a while, surprised and delighted with so much going on around us. 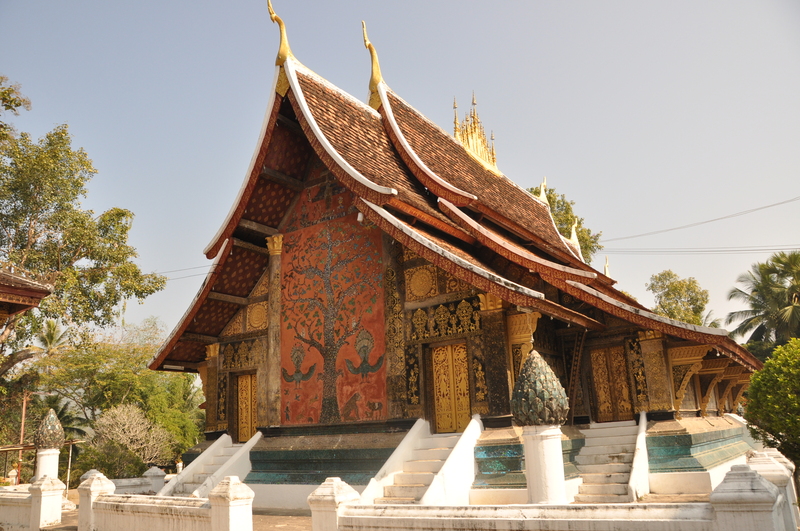 Finally, we went on with the last stop of our itinerary: the temple forest of Wat Sok Pa Luang, where I tried the Lao herbal sauna (Iván preferred to stay out of it, you can ask him why…). We finished the day with a ride along the riverside, where we saw families strolling, people doing exercise in the park and teenagers doing a bicycle and skate street show. After a dinner made of local dishes and beerlao, we were picked up at the hotel for the night bus to Pakse, in the South of Laos. We even considered the idea of skipping Vang Vieng since after enjoying the quiet and beautiful North we were not in “that” party mood. Indeed, we strongly criticize everything related to the “tubing” business created in this city to entertain party animals from all over the globe. For us, Laos is just not the place for such a thing. 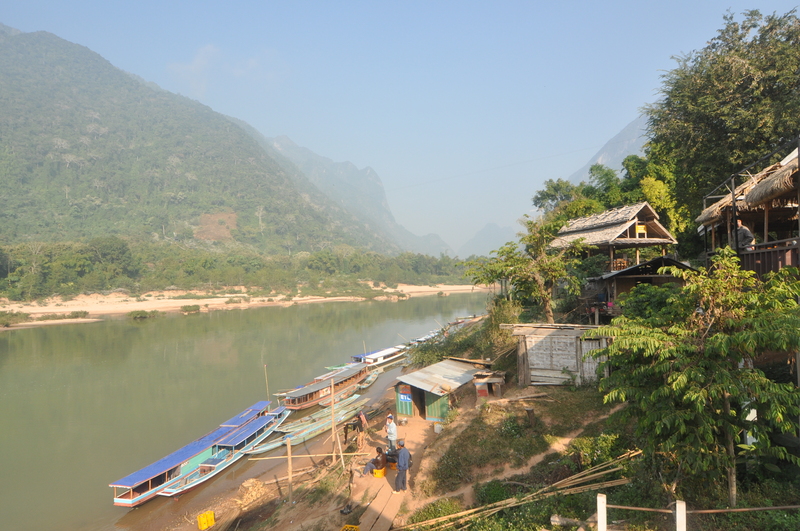 We got to Vang Vieng from Luang Prabang after a long trip through mountainous landscape. Although a bit tiring, it was rather rewarding thanks to a series of views of the sunset over the valley. We highly recommend that if you do this same trip you should try to get your driver to stop at the main view points. We got there in the late evening and at that time the city was lively but far from welcoming. Every place that has any interest is lined up in the one and almost any street of the city. The noisy and colourful street is taken by restaurants that serve semi-occidental food and continuously show TV series such Friends, The Simpsons and Family Guy. Packs of youngsters, tired after a hard day of practicing shot lifting, lie in the sofas taking care of the pizzas and burgers. We got to Pan’s Place, a little bit down the road, away from the main heat of the city where the owner gave as a warm welcome. 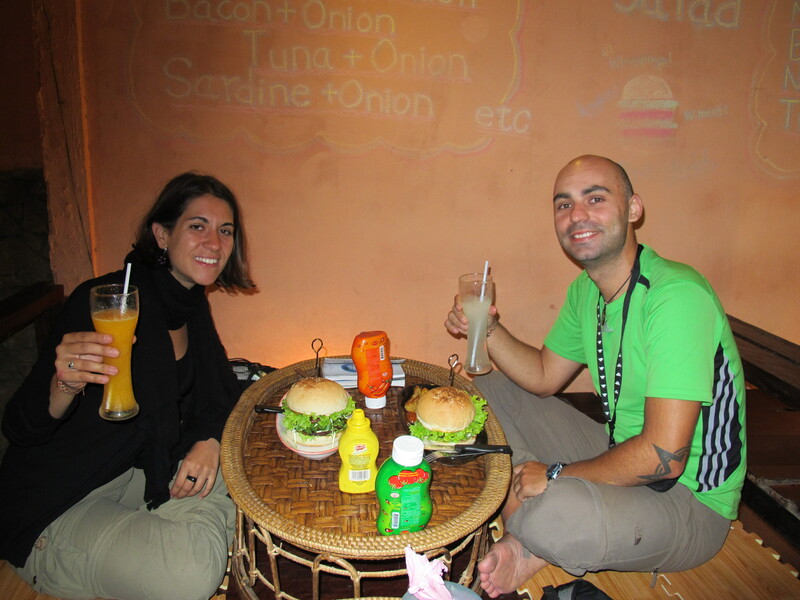 It is a backpackers place and the rooms have good cost/quality rate. Make sure you check the rooms first since they can vary a lot. Those in the inner building are bigger and quieter with a little porch. That night we decided to explore the city and find something nice to eat. We decided to give an opportunity to “Whopping Burgers” since our guidebook made a comment on the size of their burgers that we needed to verify ;). And to our surprise, we just found the best burger that we ever had in our lives!! The place is run by who might be the sweetest Japanese couple and their burgers blow your mind away. This experience should have its own post, but let’s just say here that they made our day. 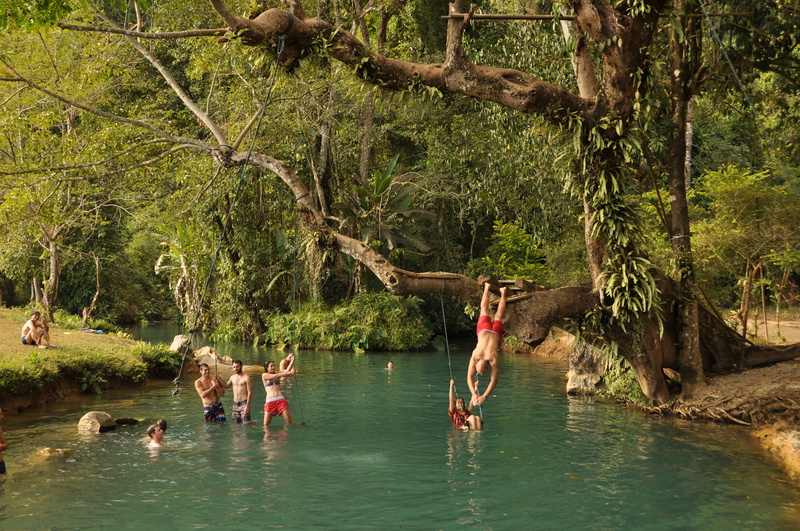 If you happen to go to Vang Vieng YOU MUST GO. We ended up having dinner there every day trying all different burgers. I will continue now that all the saliva in my computer has dried out…We were ok at Pan’s place but we wanted to check out the places at the other side of the river, which were supposedly quieter. First thing in the morning, we rented a motorbike (crappiest ever!!) and head to Maylyn guesthouse to ask whether it was possible to get a room. We were lucky to get the only room available, a perfect bungalow located at the river side facing the karstic mountains. It was then when we started to notice how beautiful the surroundings were. The only problem was that to get there you need to cross a bridge you have to pay for. There is a way to get around this, thanks a seasonal bamboo bridge that leads almost to the heart of the town (ask for its location). Try to cross riding your motorbike, is the funniest thing ;). 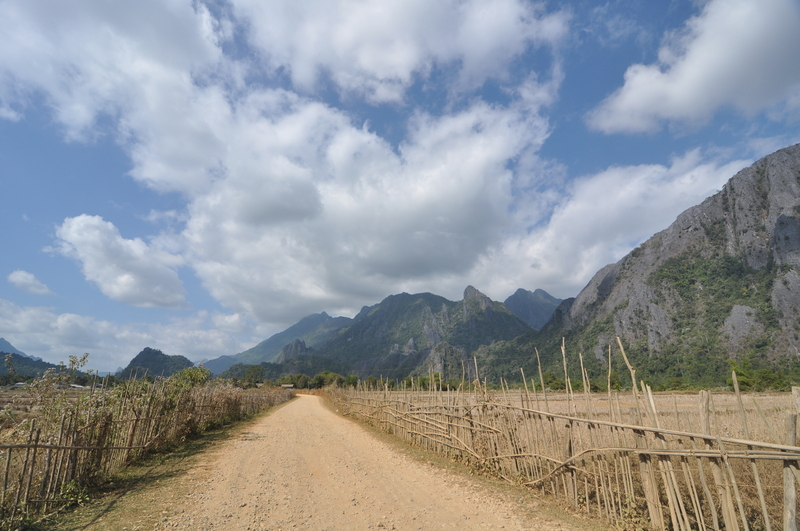 Maylyn guesthouse has the advantage to be the starting point for the Vang Vieng West Loop which you can do by bike or motorbike. The roads are very bad at some points so make sure you have enough time if you do it by bike (mountain bike recommended) and that you have some experience handling a motorbike, otherwise it can get a bit annoying. And it is here where the area shows its true colours. The place is as beautiful as you could imagine and you will have to make several stop to take pictures (learn how to take panoramic views with your camera). 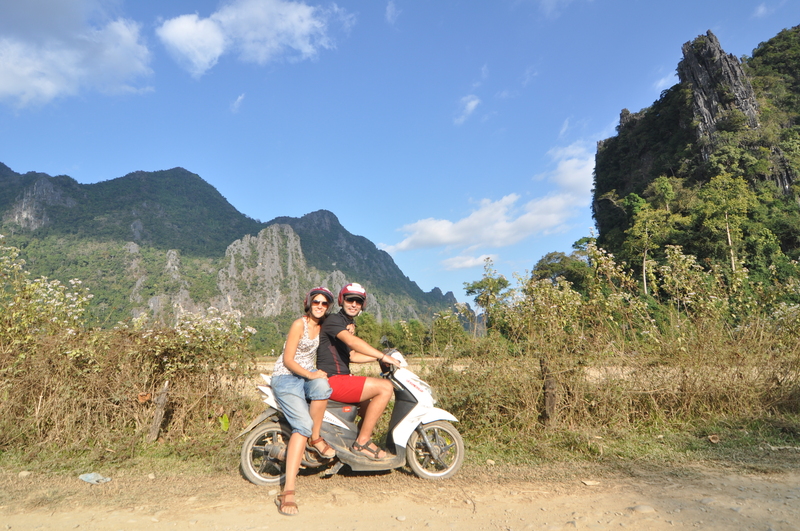 This is what we did for the next two days during our stay in Vang Vieng, renting a motorbike and enjoying all sites around the town. We specially liked the blue lagoon which is perfect place to have a bath!! If you want to find it, just make sure you do not mistake it with the “other” blue lagoon (there is another place call by this name, probably to attack tourist). We also strongly recommend the hike up the view point in this loop. It takes a bit of leg work and you will probably have to ask for directions but you will highly be rewarded by the views. Our stay in Vang Vieng was a wonderful experience all together and if you can get over the tubing culture tribes the place will reward you with a wonderful time. 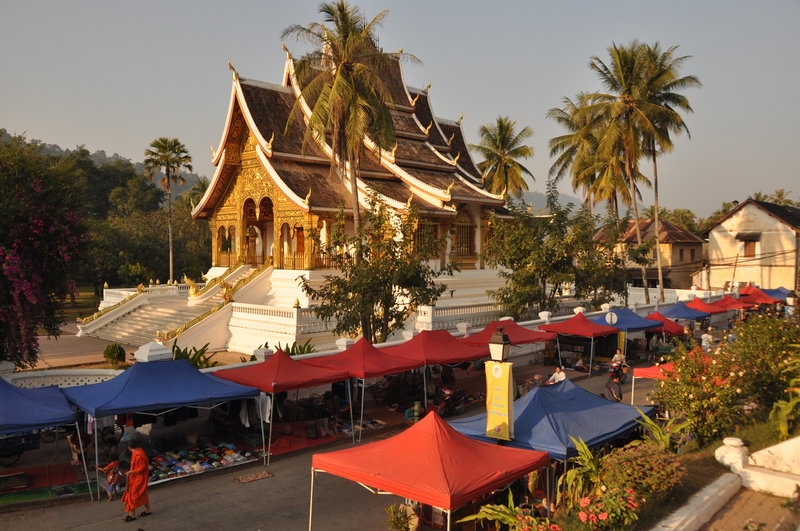 Luang Prabang is probably the cleanest and most elegant city that we have visited in the whole Asia. 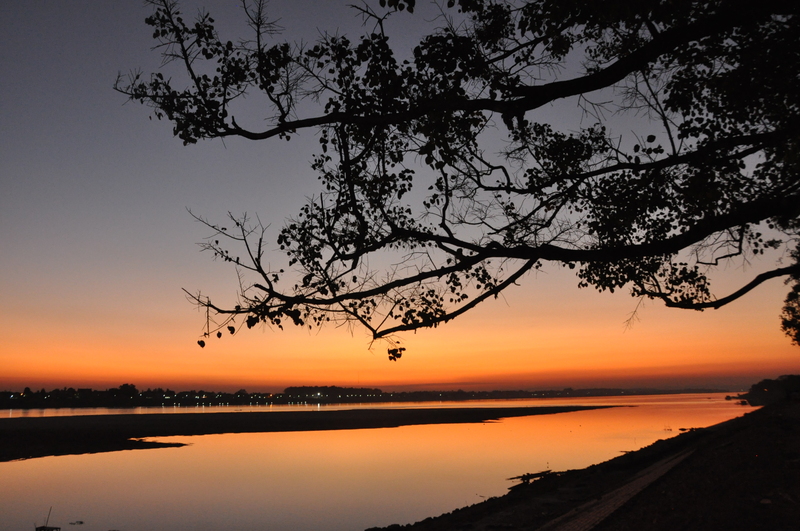 The Mekong is wide and beautiful and walking along the riverside avenue, scattered with cafés and restaurants, is fantastic at any time of the day. 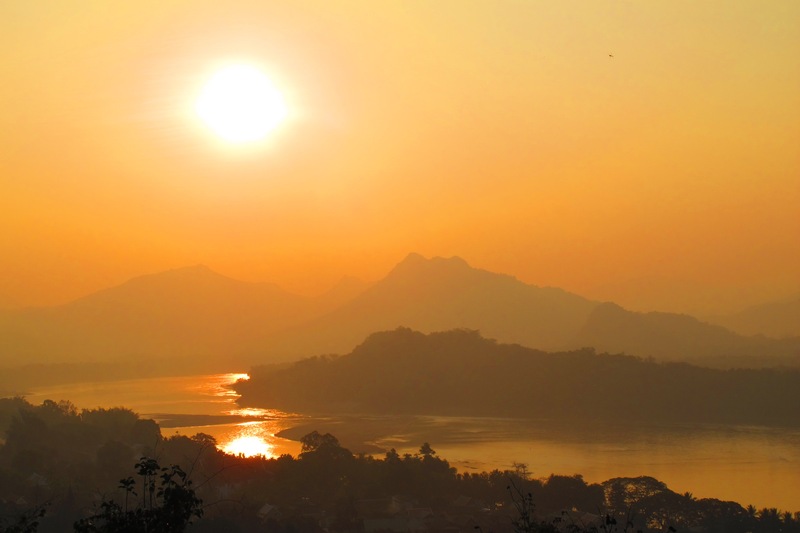 When you visit the colonial buildings, beautiful monasteries and walk through the narrow little alleys towards the Mekong, there is no doubt why Luang Prabang is the pride of the whole Laos. The first day in Luang Prabang, after a failed attempt to rent a motorbike, we ended up rented a bicycle instead and decided to explore the city. 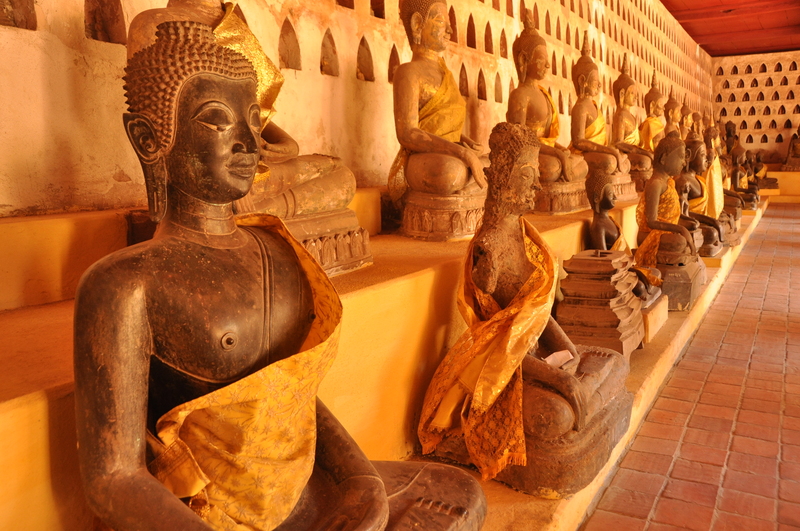 We visited the most famous monastery, Wat Xieng Thong, as well as other temples, viewpoints and the tribe museum. We also enjoy a nice bagel in a bakery and we had what probably was the best coffee in Asia so far in one of the cafeterias by the river. 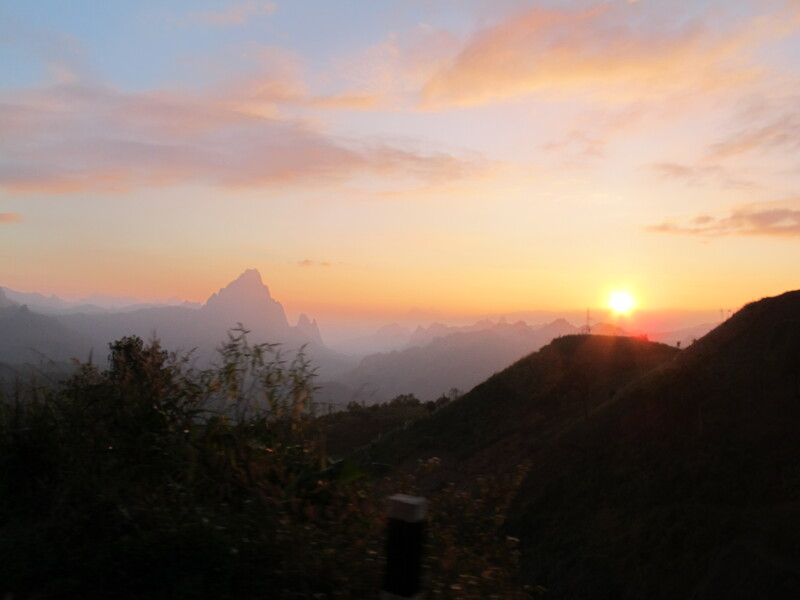 In the late afternoon, we went to the view point to enjoy the sunset. The view of the sun hiding between the two distant hills was really beautiful, but in our opinion this place has become so popular that it gets a bit too overcrowded and it has lost part of the charm. What a species humans are that we always try to get away from ourselves and when there are many of us, we do not like it! In the evening, we went to the night market, where we bought some souvenirs (despite Iván’s initial complaints) and ate good fresh baguettes with chicken and avocado, yummy! The second day I woke up at dawn while Iván stayed in bed (for once I let him to, hehehe). I wanted to see the ritual which makes Luang Prabang famous around the world: the procession of the monks, also called the monk’s alms. 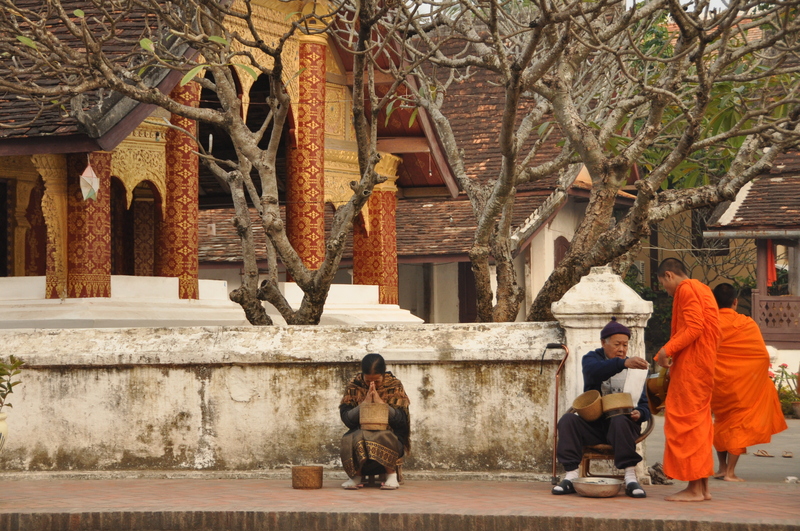 Every morning just before sunrise, the monks of the city walk around the streets of Luang Prabang, where local people await seated on the sidewalks with bamboo containers. 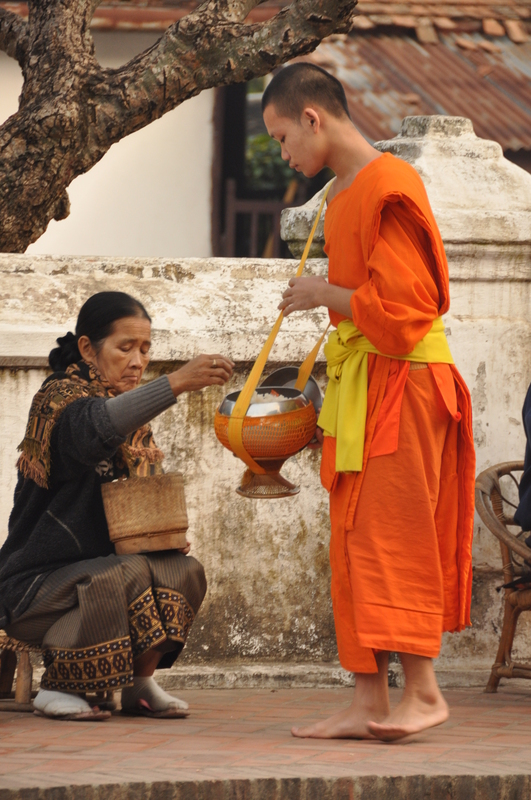 When the monks approach, the locals open the containers and take a handful of fresh cooked rice, which they put on each monk’s pot. Since the monks do not have so much money, in this way they can get fresh food everyday and at the same time, the sins of the local people get cleared with this generous act. This is a beautiful ceremony, which, however, as many other traditions in the world, is becoming a tourist circus. When I arrived to the main street, what I saw was hordes of tourists waiting for the monks in the streets. They were talking loud, taking pictures with flash and walking everywhere. When the monks came, they were approaching them without any respect and taking pictures directly on the monks’ faces, sometimes even with flash. I do not even imagine how awful these monks may feel every morning when they encounter such disrespectful tourists. Still, they behaved correctly and did not even say any complain. As I did not want to see that, I walked along the street away from the city center towards the north and I was lucky to find a quieter area with some beautiful smaller monasteries where local people were still waiting for the monks. In this area, not as touristic yet, I could seat quietly and witness the beautiful ceremony as it must have been for years. Seated across the streets and with the footsteps of the monks as only sound, I enjoyed watching such a special event. 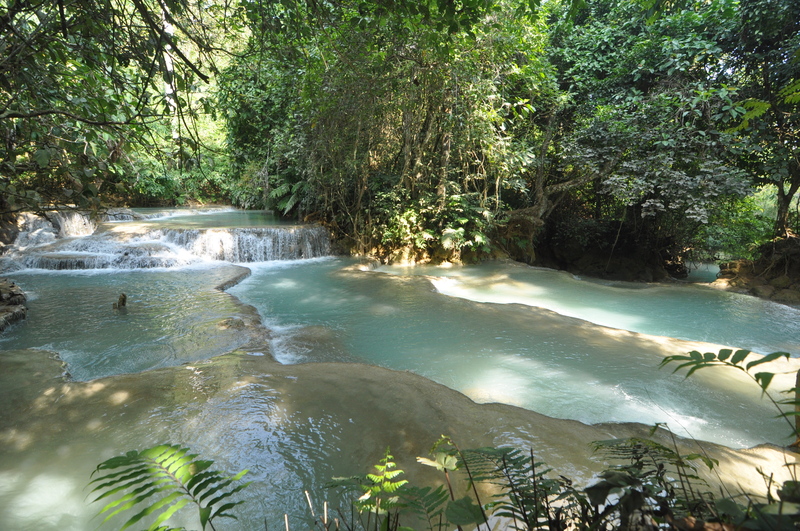 Back in the hotel, we rented a motorbike for half a day and we went to the Tat Kuang Si waterfall, 1.5 hour trip from the city. It was still early when we left Luang Prabang and it was a bit cold on the motorbike. 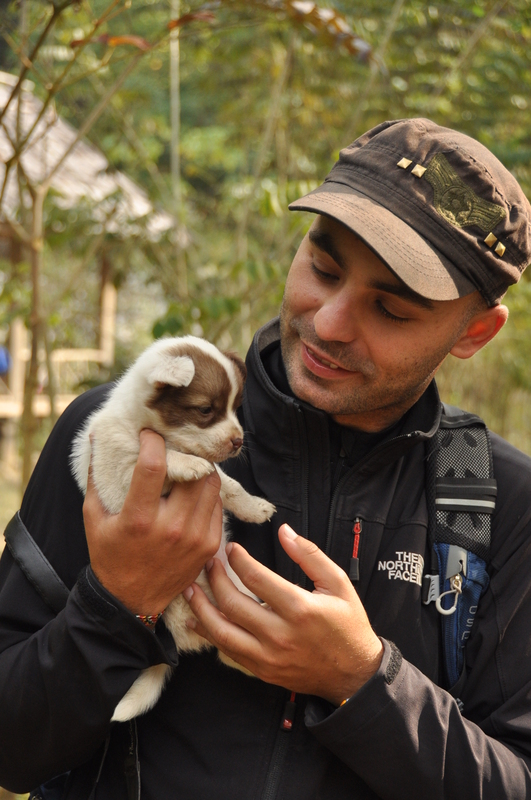 When we arrived, first we visited the Asian bear rescue center, with a few bears sleeping in hammocks and wooden structures. Then we did a little hike to the top of the waterfalls and when the sun had already started to heat the water, we decided to have a bath in the clear turquoise waters. 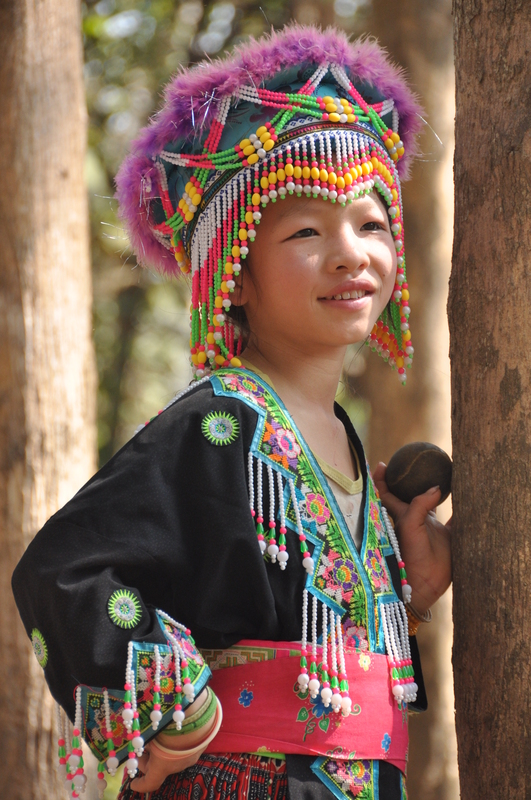 On the way back to the city, we were so lucky to meet a group of young Hmong people (one of the ethnic groups in Laos) playing “the game of love”. Just the day before, we had read about the “pov pob” game in the Tribe Museum, and now we could see the real thing going on! The game consists on throwing the ball in order to “catch a husband”. In theory, if you see a boy or girl you like, you should toss the ball to him/her, hoping that he/she returns it. But if you don’t like your prospective partner, then you should drop the ball instead. In real life, however, it is more a way of socializing between boys and girls, because it is not so common in their society to go out in mixed groups as we do in Western countries. 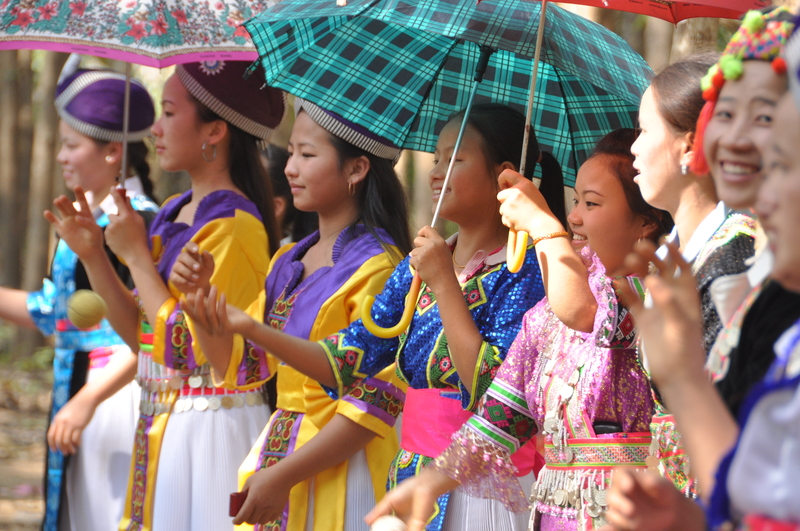 That day, the girls were wearing traditional Hmong costumes, all so beautiful and full os colours, and they were having a lot of fun playing the game. We parked the motorbike and spent some time watching them playing, completely astonish with the beauty of this people and their dresses. We came back to the hotel just in time for our minibus to our next destination: Vang Vieng. Christmas was approaching and we were still unsure about where we would spend this special night. It was the first time for both Iván and I to spend Christmas away from our families and when we thought about it we felt a bit sad. Therefore the decision on where to stay on Christmas night was tough because we wanted neither a party destination nor a place with any tourists at all, but something in the middle. Finally we decided to spend the nights of the 24th and the 25th of December in a village called Muang Ngoi Neua, in the Northeast of Laos. 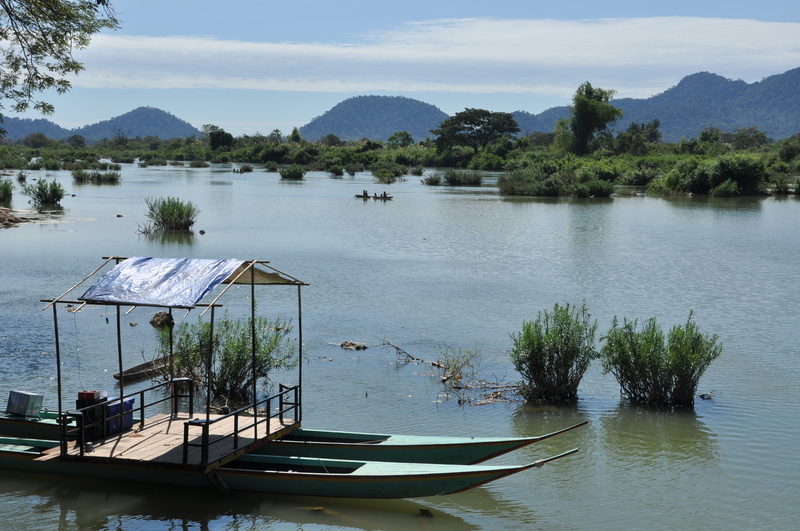 Muang Ngoi is a village located on the shore of the Nam Ou river and it is in fact only accessed by boat from the village of Nong Khiaw. To get there, we took a bus from Luang Namtha to Udomxai (around 4 hours and really scenic trip), where we spent the night, and the day after we took another bus to Nong Khiaw (around 4 hours) and a boat to Muang Ngoi (around 1.5 hours). The long trip was really worth it. 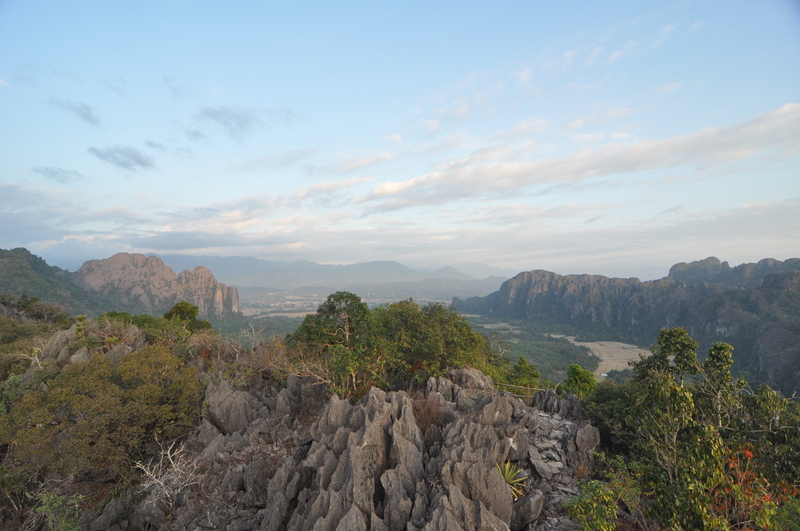 First of all the atmosphere of Muang Ngoi is special, probably because of the mix of stunning beauty of the surrounding landscape (the Nam Ou river is at its best with beautiful hills at the distance) and the lack of traffic (there are no cars, trucks or motorbikes in Muang Ngoi). Besides, during the 1.5 hours boat trip from Nong Khiaw to Muang Ngoi, we met a bunch of travelers who would be our “Christmas friends”: Thomas from the Netherlands, Kate from New Zealand, Caitling and Jay from the USA and York from Germany. 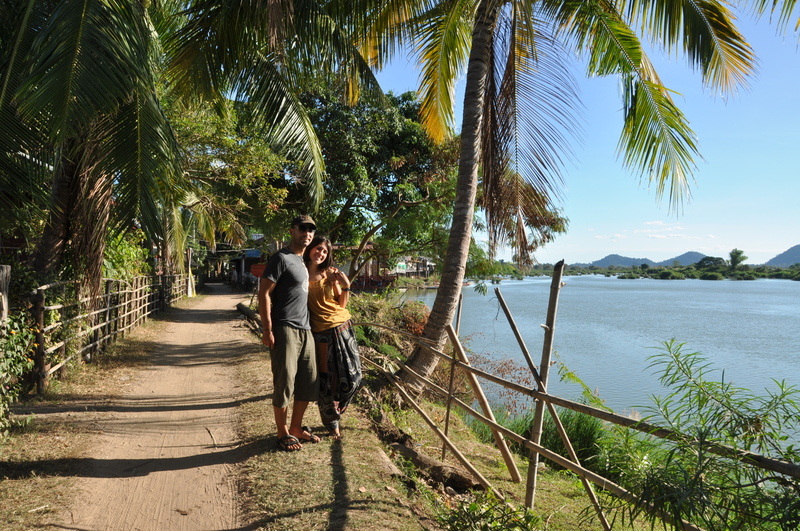 We arrived to Muang Ngoi around 2 p.m. with enough time to find a nice bungalow close to the river in Ning Ning hotel. Then we went to have some noodle soup before exploring the village, which was basically one street full of street vendors, shops, cafes and restaurants. 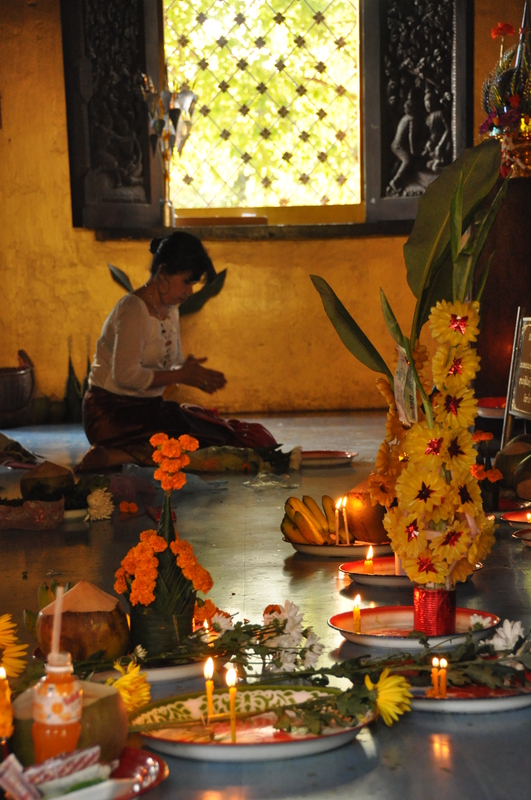 We liked Muang Ngoi from the very beginning and we were happy that we had chosen it to spend Christmas. That night, we had special Christmas dinner with our new friends: different curries (including a delicious pumpkin curry) with sticky rice, Laos national dish. And delicious fruit shakes and Beerlao to top it all. When the lights went off (Muang Ngoi only has electricity from 6 p.m. to 10 p.m.), we continued chatting under candle light until after midnight. It was a quite special and different Christmas from the ones we had lived before. The 25th of December, we woke up early and together with our new friends we went to have a buffet breakfast. We had a luxury Christmas breakfast with fresh bread, fried rice, noodles, omelet, pancakes, fruit and sweet sticky rice, in one of the restaurants on the main street of Muang Ngoi. After breakfast, we decided to hike to some of the villages that are a couple of hours away from Muang Ngoi, and Thomas, Caitling and Jay joined us. 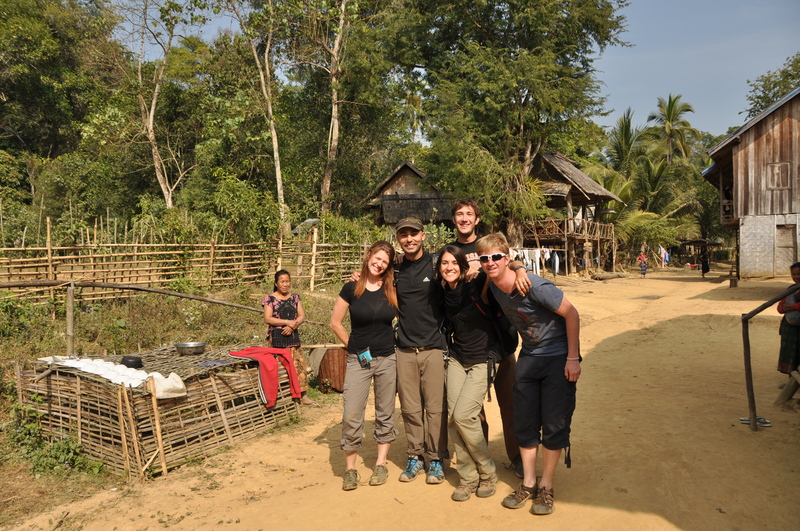 The hike went through beautiful countryside, from narrow shady paths to wide dry rice fields. We met smiley local people and we found the cutest puppy ever: coffee bean!! It was the sweetest little animal, so small that when we tried to lift his little leg, he rolled over! Iván holding cute "Coffe bean"
After visiting a cave with colorful green and orange dragonflies, we walked through more dry fields until we reached a greener area where we had to cross several streams. 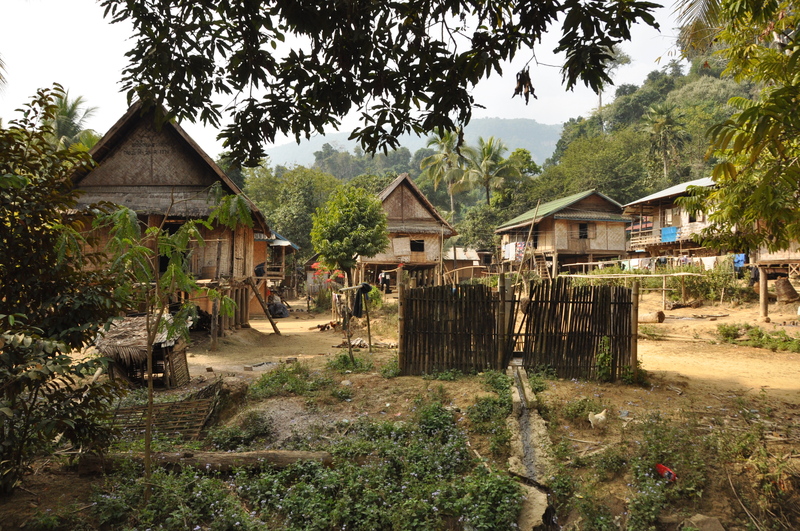 Finally, we arrived to Huay Bo, a tiny Lao and Khamu village where we stopped for lunch. While we waited for the food, we had the chance to meet some of the local people of the village and we can specially remember a really nice woman who had her granddaughter hanging in front of her. Even though she could not speak a word of English, she managed to tell us that she was the grandmother, that the mother was working, her granddaughter’s age and whether we were married and with whom…all with the sign language!! After tasting the local speciality: fried bamboo, the friendly owner of the only restaurant of the village offered us several shots of the local wine (or whiskey, depending who you ask), called Lao Lao, which was the most delicious Lao Lao of the whole trip in Laos. 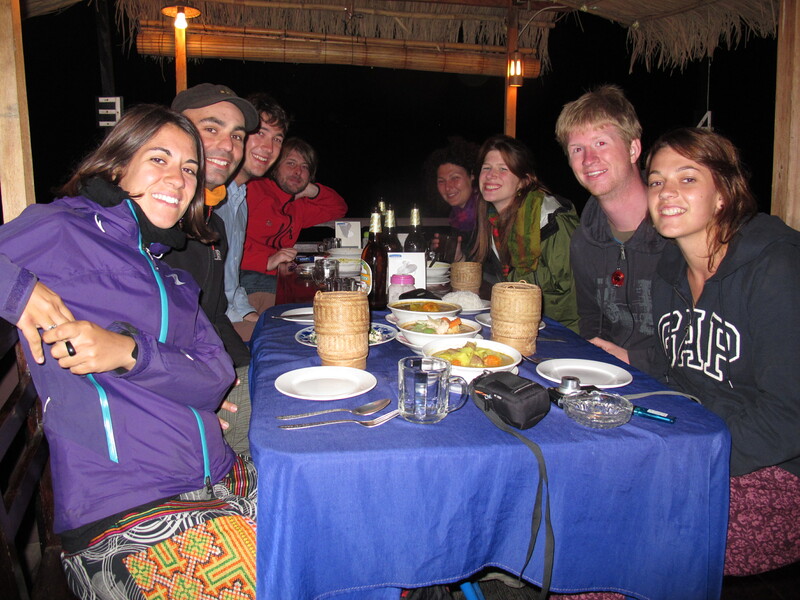 Back in Muang Ngoi and after some rest, we met our friends again for dinner at another riverside restaurant. York joined us after dinner and he played and sang different songs, for the delight of the local children. Before the electricity went off, we called home for a few minutes to wish them Merry Christmas. Even though we were really far away from our families, we felt them really close in our hearts and we really missed them, especially that night. This was the most different Christmas of our lives. 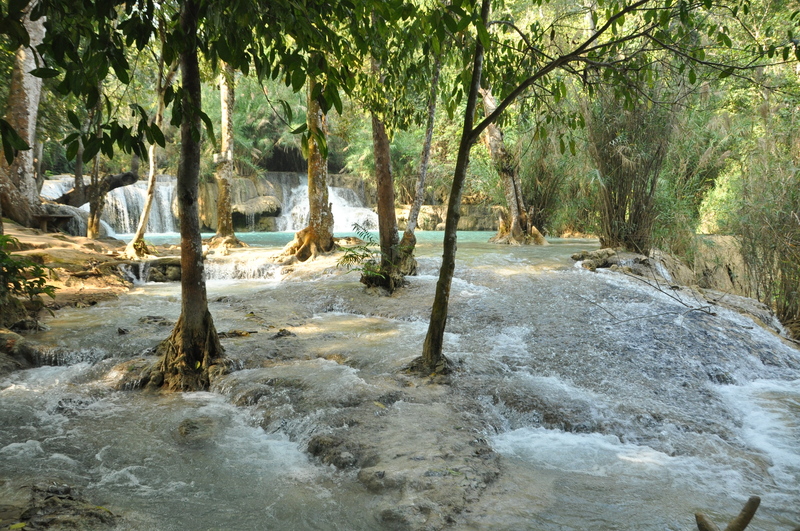 But we were happy that we spent it in Laos, and particularly in the beautiful and quiet Muang Ngoi. The generosity and friendly personality of the people in this village are outstanding and our Christmas friends Thomas, Kate, Caitling, Jay and York were the perfect company for such special days. 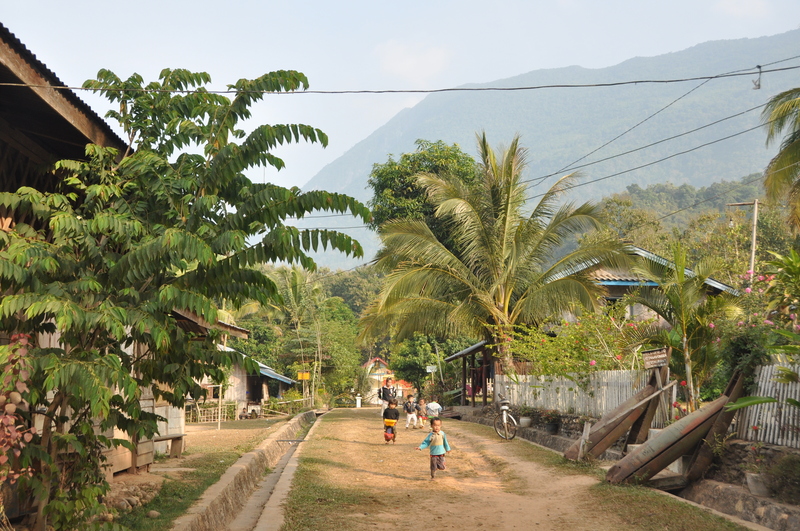 One of the villages near Muang Ngoi, with our "Christmas friends"